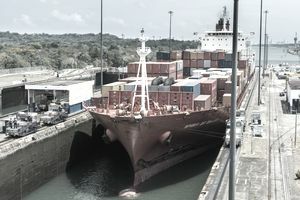 The Panama Canal connects the Atlantic Ocean to the Pacific Ocean via the Caribbean Ocean. It allows ships to avoid sailing another 5,000 miles around the southern tip of South America. The canal's engineering is complex. It's more involved than digging a long trench at the shortest point which is the Isthmus of Panama. First, the sea level of the Caribbean is eight inches lower than the Pacific. Second, the two oceans have different tides. Third, the Isthmus of Panama rises 26 meters above sea level. The Panama Canal solves the problem of different sea levels. It sends ships through a series of three locks. First, the locks lift the vessels up to Gatun Lake. They then lower them through three more locks back down to sea level. On average, it takes 13 hours to move through the canal's 51-mile length. The expanded Panama Canal opened on June 26, 2016. The expansion added a new third lane. That doubled the canal's capacity. Most important, it accommodated Neopanamax ships. Each one is 1,200 feet long and carries three times the cargo of 965-foot-long Panamax ships. Between 2016 and 2018, at least 5,000 Neopanamax ships have gone through the canal. That efficiency lowers your food costs. Panama receives $1 billion in tolls from the canal. That will double or even triple now that the expansion is complete. It was delayed by a year. Cost overruns added $1.6 billion to the $5.2 billion price tag. The expanded Panama Canal keeps the cost of imported goods down. That lowers inflation. All of these ports and the port of Charleston already can or will be able to receive Neopanamax ships by 2018. Traffic is expected to double at these ports by 2030. Expansion of the Canal makes the U.S. transportation system run more efficiently. It relieves congestion at the LA/LB port. Most of that port's traffic comes from Asia. The canal creates more U.S. jobs. It's given U.S. exporters better access to China and other Asian markets. Cargo through the canal increased by 23% in the first nine months of 2017. That brought millions of dollars to U.S. East Coast ports. Traffic at the ports is up 29%. It's become cheaper to ship through the Canal than ship to Los Angeles and move through goods by rail and truck. The fastest way to get cargo from China to the U.S. East Coast is by ship and rail. It takes 18.3 days. That includes 12.3 days for a vessel to go from China to the U.S. West Coast. Cargo on a train takes six days from the West Coast to the East Coast. For this reason, 75% of Asian imports take this route. Before the expansion, only 20% of cargo ships from Asia took the Panama Canal route. It took 21.6 days. The remaining 5% of China's trade to America goes through the Suez Canal in Egypt. That takes 21 days. The canal’s expansion could take 35% of West Coast freight. The Neopanamax ships carry as much as 16 trains. Expanding the canal makes this longer route more profitable for commodities exporters. They need to cut cost more than they need to reduce time. The expansion will open the Asian market for U.S. natural gas exporters. Before the expansion, the canal was too small for liquefied natural gas ships. High-value, time-sensitive goods, such as electronics, will still use West Coast ports and rail. The French began building the canal in the late 1800s. They gave up when they ran out of money and lost too many workers to tropical diseases. In 1904, the United States bought the Canal Zone. It wanted to expand its shipping and naval power between the Atlantic and Pacific Oceans. It paid $10 million to Panama and $40 million to France. U.S. engineers decided a canal lock would protect ships from landslides in the Andes Mountains. U.S. doctors found treatments for the tropical diseases of malaria and yellow fever. The canal construction created jobs for Pittsburgh steel mills, Portland cement factories, and General Electric machinery. Forty-five thousand workers went to Panama to work on the canal itself. Between 10,000 and 15,000 of them died from accidents and diseases. In 1914, the Panama Canal was completed for $375 million. The United States owned the canal inside the country of Panama. In 1977, President Carter signed a treaty that promised to turn the canal over in 1999. The agreement allowed the United States to intervene anytime that its use of the canal was threatened. By that time, the canal cost more to run than it returned in profit to American companies. Railroads were much faster and their costs had fallen. The treaty also improved relations with Panama and the rest of Latin America. But many Americans saw it as an American retreat from its global power. Neopanamax ships carry 5,000 to 8,000 containers. Each ship is 14 to 20 containers wide. They need a channel 17 meters deep. Super Neopanamax vessels haul more than 13,200 containers. These ships carry 27% of the world's cargo. To remain competitive, the Panama Canal had to expand to accommodate these ships.